Soft Cover, 128 pages, 7.25 x 9.25. Make your own soft drinks that are tastier, healthier, and cheaper than anything you'll find in stores. 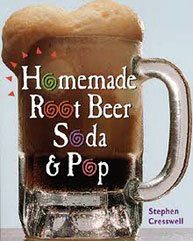 From soda water to sarsaparilla, in Homemade Root Beer, Soda & Pop, you'll find easy-to-follow instructions for more than 60 traditional and modern soft drink recipes. Your whole family can make delicious batches of old favorites and experiment with new combinations of natural ingredients to create your own refreshing recipes. You'll make fabulous, fizzy creations like old-fashiond root beer, sarsaparilla soda, birch beer, Virgin Islands ginger beer, lemon-lime soda, cherry vanilla soda, cream soda, raspberry shrub, molasses switchel, coffee whizzer, fruit smoothie, and much more!